Bothered by the Supreme Court’s ruling electronic surveillance violated the U.S. Constitution and the Bill of Rights, in 1968, Congress enacted the Omnibus Crime Control and Safe Streets Act which the President signed into law permitting its use. Collectively known as Title III—the section of law where the electronic surveillance provisions can be found—the statute gives the FBI and their law enforcement partners, the ability to conduct “wiretaps” and install listening devices, as long as they are authorized by a District Court. 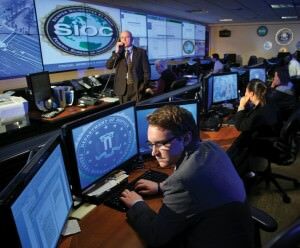 Before enacting the legislation, many agency and department heads had differing views concerning whether electronic surveillance was legal—although most agreed “eavesdropping,” agents usually collected important evidence. Reflective of the controversy, during the Prohibition Era, treasury agents were authorized to use “wiretap” evidence developing cases against bootleggers and rum runners. But prosecutors at the Justice Department headed by Attorney General [AG] Harlan Fiske Stone thought evidence obtained using electronic surveillance was “unethical,” telling the FBI it couldn’t employ the practice. Thinking “eavesdropping” violated the 4th and 5th Amendments, opponents sought the Supreme Court’s review alleging constitutional violations. Known as Olmstead v. United States [277 U.S. 438 (1928)], the High Court dismissed arguments made by Constitutionalists stating evidence obtained via electronic surveillance was admissible. Explaining their ruling jurists said the conversations were “not” forced, but rather voluntary and further were “not” considered a search and seizure in violation of the 4th Amendment. But despite the High Court’s opinion, the controversy remained, later creating an appearance problem when the Bureau of Prohibition was transferred to the Justice Department. But because gang violence was on the increase, then AG William B. Mitchell said it was time for the Justice Department to alter its course. He said electronic surveillance could be used, but only in special circumstances. Thereafter, in 1967, the Supreme Court overturned1 the Olmstead decision which paved the way for the aforementioned Safe Streets Act. Directory members can be extremely helpful to anyone seeking information and/or requiring a professional opinion concerning electronic surveillance. Looking for an expert—visitors can use the website’s search feature, entering the appropriate skill and geographical area of preference, to locate a retired FBI agent / analyst and thereafter make contact, using the information provided. Retired FBI Agents and Analysts with a background in electronic surveillance, interested in securing a Directory listing and/or a personal email address, need only submit a brief online application to join the website. 1 See Katz v. United States. 2 Information contained herein can be found in the Electronic Surveillance Manual prepared by the Office of Enforcement Operations, U.S. Department of Justice; and a publication entitled, “Electronic Surveillance and Civil Liberties,” prepared by the Office of Technology Assessment.